If you are thinking, "I have seen this before", you are right! This is the 2nd Ladies of the Sea in 6 months, and the 3rd in the past year. 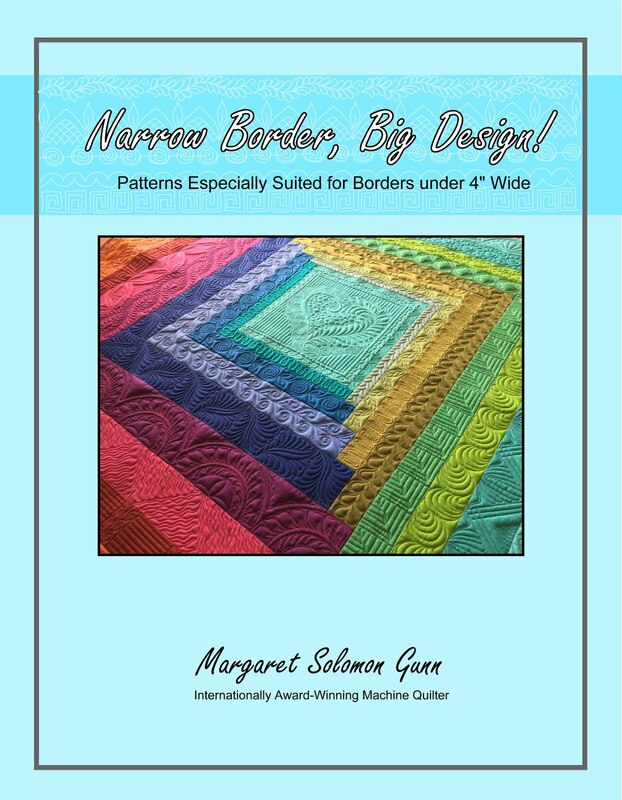 It is a beautiful and daunting quilt to imagine hand appliqueing, and almost as daunting to get to longarm quilt! This one is a little different in that it has a pale green fairy frost background. While I like to try to make each quilt individual, I also am challenged because I love the look of the rays behind each boat. In the end, I did the rays anyhow. The fillers on this particular quilt are different than the last 2 quilts though. It has a single wool batting. All appliques are ditch stitched with Madiera Monolon, and the fill is done with a soft green Glide thread (40 wt poly). I wanted simple quilting that just let the applique show, but still provided a little bit of a textural variation. The corner stars were the biggest challenge, as the piecing lacks a little precision. Too much detailed quilting that couldn't possibly align properly would only show off the anomalies. I aimed for simple, trying to draw the eye to the texture of the background rather than the star. I want the viewer to have to really study them to know that they are a little imperfect. We all love shots of the backs, especially when they are mostly solid!... It is simply gorgeous. I am om my last 9 days of freedom before school gets out - frantically trying to quilt up a couple class samples, and work on the fine details of my show quilt. It was too warm today to have that beastie-boy on my lap, but it may be cooler later this week. "Must Make Progress", that is my motto. 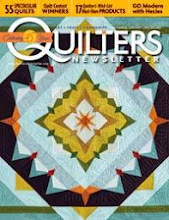 Here's a little blurb in the current Quilter's Newsletter I stumbled upon last week. That is a partial pic of my Jester's Folly quilt, which will be on its way to the Shipshewana Quilt Festival in a couple weeks. Here is a light custom from last week. It is pieced from a variety of fabrics - both cottons and a teal batik. I was wrapping up a couple easier quilts before I loaded one last big custom (the 3rd Ladies of the Sea of the last year!). I could have easily just done an edge-to-edge pattern, but this is a gift for a special person that is getting married. I had the OK to up the ante a bit. 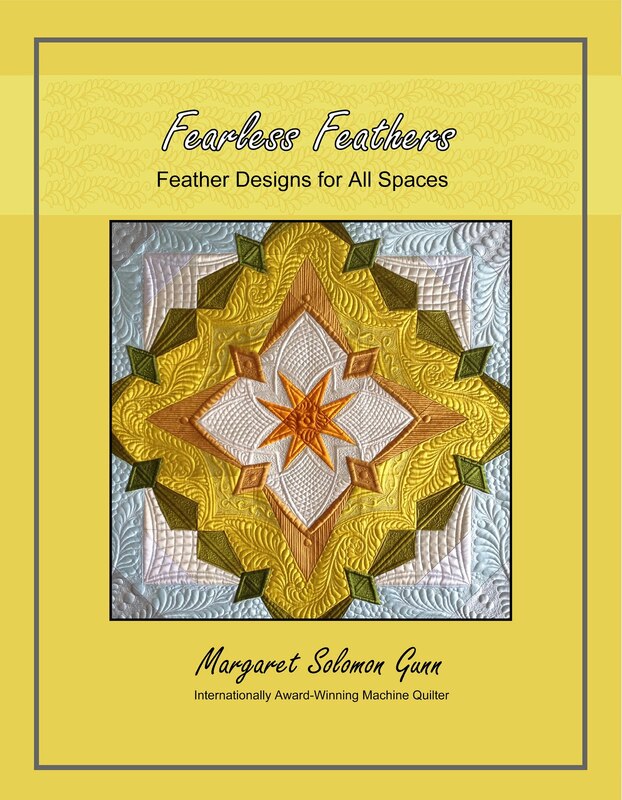 The ivory fabric is a great place to let the quilting show more. To keep the time manageable, I still mixed in some fillers, like the swirls on these blue octagons. Mixing more custom techniques, like those quilted with rulers or feathers, with the faster fillers is a great way to give a quilt a custom look without an enormous cost. The outer border is this speckled dot. I did a quilt last year that had a good bit of this on it, and knew not much of anything but linework was going to show. Save the time for plainer fabrics. While there is some ditch-quilting, there is not as much as some quilts. 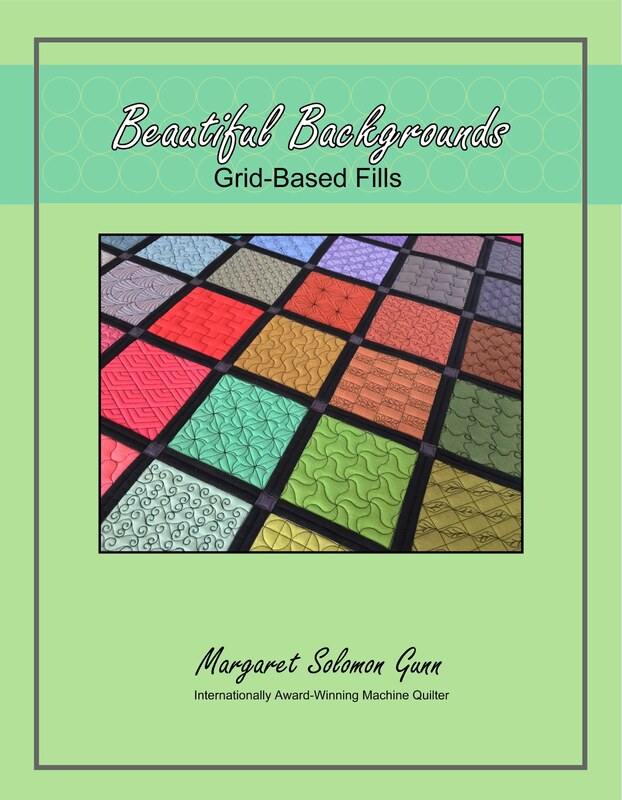 This, too, helps to keep the cost from that of a show quilt to that of a pretty bed quilt. It has an 80/20 batting and is quilted with YLI polished poly beige thread. Here is the back, looking very aqua in the photo. Ironically, it is a deep green. Strange! The ivory bobbin shows quite prominently here! It makes me wonder if I should have selected a soft green or aqua thread instead, so there was less visible contrast on the backside! I have one other small secret to let out of the bag...I came across this on Amazon recently. Though the editorial gurus at AQS are busy at work deciphering my patterns and chicken-scratch, somebody has already posted a glorious cover shot of my upcoming book! This is scheduled for a fall release, but I will update everyone on that when I have previewed the draft and know better. 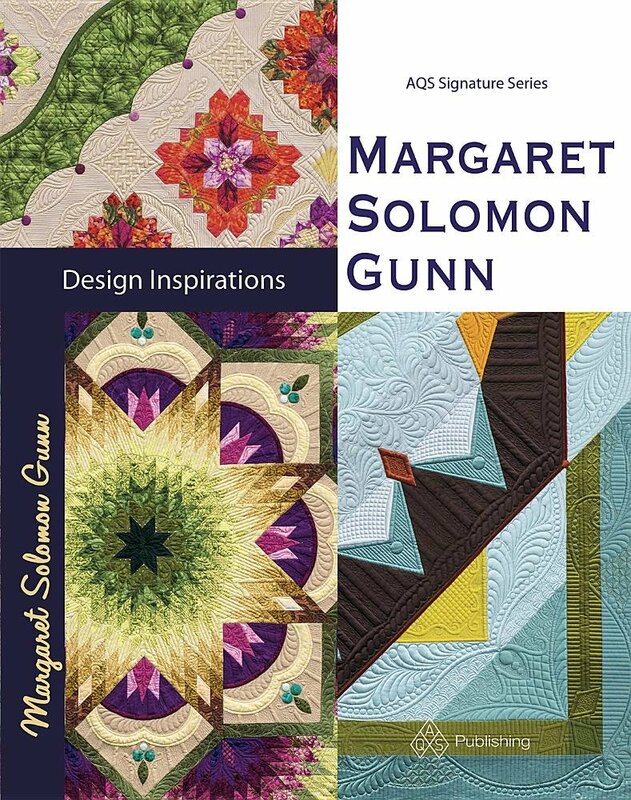 The book is a new style for AQS - one that shares my history, design inspirations for the 3 quilts shown on the cover. 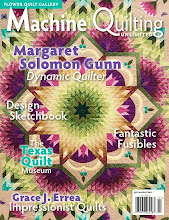 It also will give full patterns as well as quilting motifs. Seems ambitious! It is only fitting on May 23rd, my first official day of being 50, that I entitle my post "Something Old". The birthday was just about everything I expected, or dreaded, it would be. I realize it is just a number, but the number 34 was a lot better. It was a happier, funner time. The realization that you are a half-century old is hard to swallow. It definitely bites to think that you are on the downhill side of your life. All of these thoughts and feelings hit me hard yesterday. It didn't help matters to have a 14yr old in complete "don't care" mode when we were trying to get out the door to go out to eat, or getting THE pan my husband really wanted for his birthday wrapped up for me, or the bit of very disappointing news that came out at dinner. It all left me wanting a do-over... a do-over from about 2000. I have been doing a few things for clients that I don't think I can show. 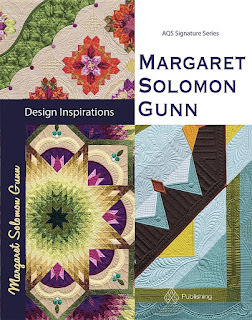 I did a little quilt for a book Bonnie Browning is publishing with AQS last week. Once the book hits the shelves later this summer, I can show it. I also did another client quilt, but the photos are still on my phone. I have hand stitched about 70 tiny silk dots onto my quilt. It still has loads of work to go before I can bind it, but its making progress. This week I must do a Ladies of the Sea...my last large custom for a while. A month ago, I resurrected this. It was appliqued in 2012. Actually there are 4 blocks, which I designed -- two are based on ceramic tiles. I was set to finish this 1-2 yrs ago until I discovered another quilter had made one of the blocks nearly exactly to mine. Coincidence or did she find the tile too?...no clue. Either way, I quit. It was initially conceived to have a center peacock, but I have omitted that, figuring it might get done sooner this way. I dreamed up some green frames, added some blue bias trims, and machine stitched it on. I had bought a bunch of fabric, and wanted to use it (ie, not buy more). My sketch of what I envision doing is here. There is a little more applique to do, someday. Here's my "cheater" background. With the fabrics from 4+ yrs ago, it is hard to find more of them now, and it turns out that I don't have quite enough. SO...I pulled some junk flower fabric and pieced the background with it. This is because once the plates are appliqued down, this "junk" will be cut away and tossed anyways. ...as this shows. It's not yet stitched, but given all the baseball I have in my future, I may have some new car projects. Stay tuned to 2020, when I will show another update to this slow-moving quilt! Let me show you what I have been working on since returning from Paducah. This is my mom's quilt, made for her sister for her 80th birthday. Being busy, I told her "only if it's an edge to edge". 3-4 hours later, here it is. It is stitched in a soft peach thread that matches the fabric. It seems a bit odd, but with all the printy blues, I just wanted to see the thread. Rumor has it, my aunt loved the quilt. Here's a look at the backside, which is a soft flannel. After that quilt I did another edge to edge for a client's grandson -- Minions! I seem to not have any pics of this adventure though. My next quilt, for a gal in Portsmouth is this "kaleidoscope" quilt. It's not too big, somewhere around 50" square. It is batik, but I struggled to create texture that would show. Lots of lines, some feathers, and other textural patterns. Here's a look at the center. The challenge comes trying to ditch some of these sections that are not pressed to the side. Piecers, please consider this when you opt to press many seams open. It's always nice to have points pointy, but that is challenging when they cannot be easily ditch stitched. I am working to maybe finish my hexie quilt. Maybe is a pretty big word these days. I'd like to consider having it done for MQX Midwest in Oct, but who really knows. The quilting is 99% done, and I am now deep, deep in the trenches of the detail work. I am appliqueing pearl cotton around the hexie stars - to the tune of over an hour per star. Only 14 more to go...sigh. On the bright side, it looks great. Last week, I told a friend and fellow quilter, Jackie Kunkel, that I would take a quilt of her's -- one that has a really quick turn around. It arrived Saturday, and I quickly got to work designing what I would do. It is very modern, and is to show her new fabric collection with Island Batiks that will debut this fall at Market. I can only shop small snippets until October, but believe me, I am itching to show you all of this beauty! I really hate many modern quilts. Until now, I really thought I hated quilting them more. Boy, have the tides turned. This one was actually fun. I got to use so many interesting filler stitches. 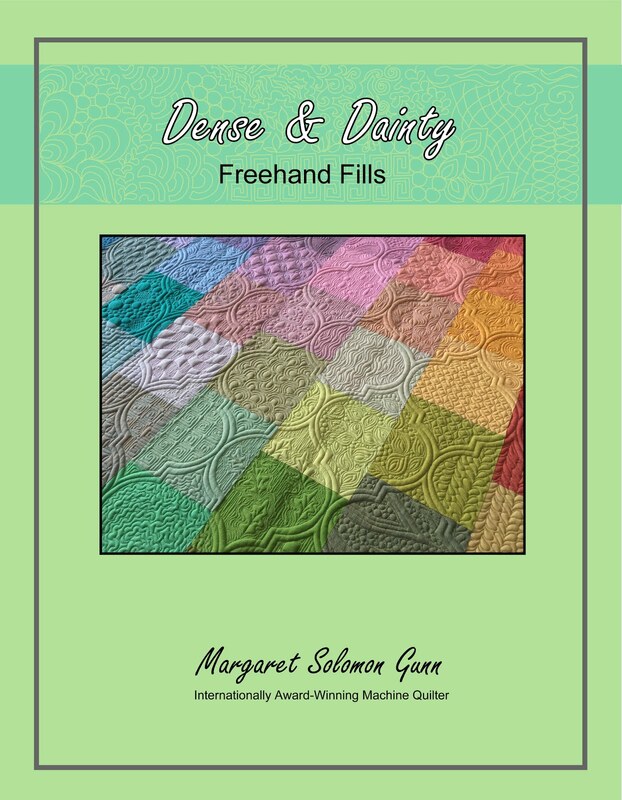 I credit this to my Dense & Dainty class on fills that I have taught, and will teach at Quilt Odyssey and MQX Midwest. This quilt just sailed! The only ruler work is on the triangles -- everything else is freehand and imagination. I have a couple other quilts in the works that I will likely procrastinate on showing, as that seems to be the trend. It's not my desire, but it just happens. How do you keep it all together?! ?